"I PROVIDE AND MAINTAIN SECURE VOICE AND DATA COMMUNICATIONS SYSTEMS SO THAT EVERYONE FROM A FRONTLINE SOLDIER TO THE GENERAL CAN COMMUNICATE WITH EACH OTHER." On the battlefield, the provision of voice and data communication systems are crucial. Commanders may need to speak to their troops or report back to the UK. This is why you are critical to winning the battle. Communications Engineer Systems Operators are expert in advanced satellite, radio and computing technologies. You are given modern, industry-linked training and how to operate the equipment required to provide communication systems. You use your knowledge and skills to deliver advanced battle winning communications and conduct defensive cyber operations across the globe. You can receive a range of qualifications up to a degree and later, you can specialise as a Special Forces Operator, Advanced Cyber Operator or an Explosive Ordnance Disposal Operator. Become an expert in operating a multitude of Information Systems and Services, including radios, satellites, computer networks and applications. Get continuous professional development, from a Level 3 NVQ in ICT and civilian accredited training up to a Bachelor’s of Science Degree. 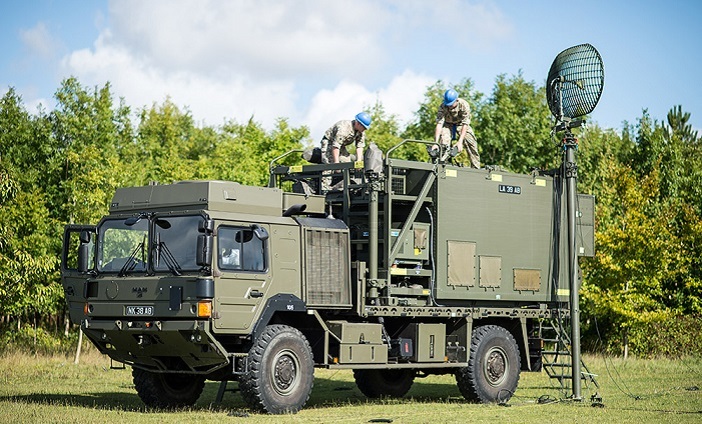 Learn how to drive and operate the vehicles that communications equipment is transported in, including HGVs and Armoured vehicles. Access a wealth of specialisations, including Airborne Forces, Special Forces, Explosive Ordnance Disposal and Cyber Operations. If you excel, you can be undergo fast track promotion to Staff Sergeant, undertake a degree course and become a manager of complex communication systems. Then you’ll study to become a specialist at the Royal School of Signals in Blandford. Here will begin the technical training you will need to fulfil your future role. You will study information technology fundamentals, antenna systems and propagation, defensive cyber techniques and how to communicate using military systems. In addition to this you will study the management, maintenance and operation of the equipment used regularly by the Royal Signals, including the setup of a complex digital radio detachment, which one day you could command. Driving licences: B+E, C+E, D1. Earn £15,230 during training. When your Initial training is finished, and you join your unit as a Signaller your pay will rise to £18,859. Golden hello available of up to £5,000 when you finish your Phase 2 training. "As a Engineer Systems Operator you can find yourself deployed in a variety of roles. You could be working in small groups to provide the communications for a deployed headquarters, with a mission ranging from a humanitarian tasking anywhere in the world, to disarming explosive devices within the UK. Additionally, you could be working as the sole operator, responsible for transmitting the orders from the Brigade or Divisional commander, or your could be responsible for providing the communications and operating the equipment on behalf of hundreds of staff officers deployed within a headquarters." Basic training teaches you how to be a soldier. You will learn how to survive outdoors, fire different weapon systems, fight on the modern battlefield as well as developing key life skills. European Computer Driving License (ECDL) to Level 1 incorporating units 1, 2, 3 and 7. "I have had an interest in joining the military, however instead of beginning a career in the Regular Army, I started a career in web design and joined the Army Reserves. With a background in information technology, the Royal Corps of Signals was an obvious choice. I have gained skills from service in the Royal Signals that I don’t think I could have developed in any other walk of life. By far the most exciting thing that I’ve done is learning to ski in Austria; this gave me new found confidence - and I got paid to do it too!"